Pacific Northwest was posted on August 2nd, 2018 at 9.10pm and is filed under travel..
We’ve been vacationing in the Pacific Northwest for over a week now. We drove from Colorado, through Utah, to Idaho, into Oregon—where I saw for the first time in my life a fox, in real life, running across the road (while I was definitely, maybe, probably not following Oregon’s ridiculously slow speed limit)—and then into Washington. Tomorrow we will venture into Canada for a day and night before we head back to Colorado. The PNW is familiar in ways that I can’t quite put my finger on. Maybe because the tall, tall trees and sea salt air are what my heart always longs for. (Why do I live in the desert?) Oregon is gorgeous with big sandy beaches and massive green trees. Portland feels a little like a place I belong with the most delicious food and shops dedicated specifically to terrariums and bubble tea. Everyone is kind and quirky and just really special. We spent several days with my dear cousin Halee and her husband exploring farmers markets and ocean towns and wandering the rows and rows of their flower farm. It’s a place so magical that I can’t help but slow down and appreciate the black, fuzzy bumblebees lumbering between flowers, collecting every bit of pollen the can bear to hold. My cousin continued to extoll the virtues of Portland, being sure to hook Eden into going to college there, hoping that she would later bring her parents to Portland as well. All the while we talked about the cheap, cheap farmland in Western Colorado, working hard to convince them that a flower farm is exactly what WestCO needs. I’m pretty sure all of this convincing on both sides is because we really just long to do life together and that’s really hard to do with a couple states between you. I really love my cousin. When we crossed into Washington Josh said that it felt different somehow from Oregon. And it did, but in ways neither of us could quite put our fingers on. Everywhere I look I see a Wes Anderson vignette, in the best possible ways. And it smells like earth and pine needles and the sea. We’ve driven through canopies and canopies of trees with ferns sprouting up from moss beds beneath. Everything is so green and sometimes the canopy overhead is so dense the road becomes dark and it feels familiar again, a little like there is magic in the air. We’re staying in a vacation rental that’s literally right on Port Gamble. 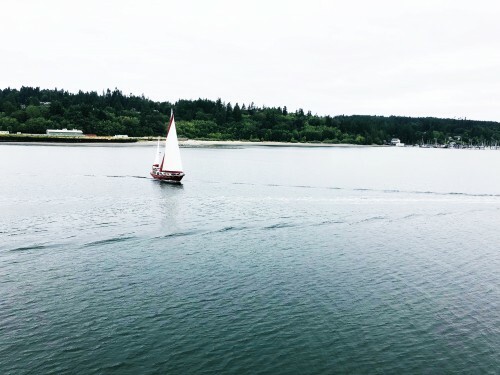 I look out from the table and see six different kinds of pine trees, each over 100 feet tall, framing the bay where boats are anchored and a sandy beach is revealed across the way, but only when the tide is out. I’m sure I’m going to see a whale at any moment. (The kids feel this dream is ridiculous, but I know it’s possible.) How do places like this exist on earth? Life is such a gift. We’ve ridden the Bainbridge Ferry back and forth a few times, adventuring in Seattle. The ferry itself is magic and I’m sad that we won’t get to ride it again. I imagine that the commute gets old for people who have to take it every day, but it’s amazing to me that someone’s real life could exist with a boat ride across the Puget Sound at the beginning and end of each day. The city looks familiar but feels way different than I expected. It’s much more of a city-feeling city than Portland. Seattle is cool, but I think the special part of Washington is in its small coastal towns. 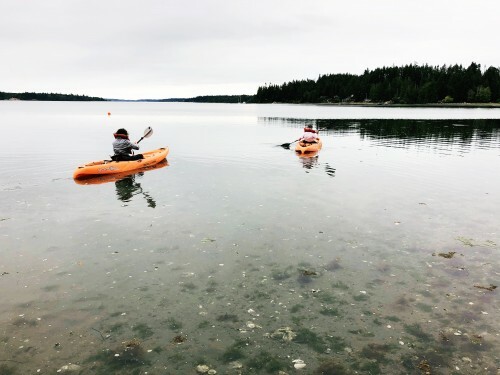 We took kayaks out on the bay tonight floating lazily while we watched crabs scuttling around on the ocean floor, climbing over oysters, through billowing forests of seaweed. It’s been cloudy today and even though it never rained, the air is heavy with moisture. 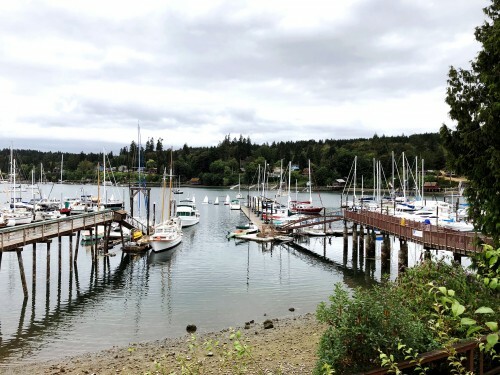 Earlier we turned the kids loose in Bainbridge Island’s downtown, buying ourselves a little one-on-one time, sipping wine and eating clams while we looked out on the harbor. I’m not sure I’ve taken enough pictures. I’ve been so entranced by this green, lush landscape, the smell of the ocean, and the towering, tall trees. I read once that you remember something better if you see it with your own eyes rather than through the lens of a camera. I’m not sure I trust my memory, but I hope that’s true. Although life is never, ever easy, I often look around and marvel at where I find myself. The ocean and all it’s beauty buts just up to the forest with all its wonder. How are these places real? How does this exist? How is this wonder not here but as a gift, just for us?